By olduvai in Energy, Environment, Geopolitics on August 14, 2018 . 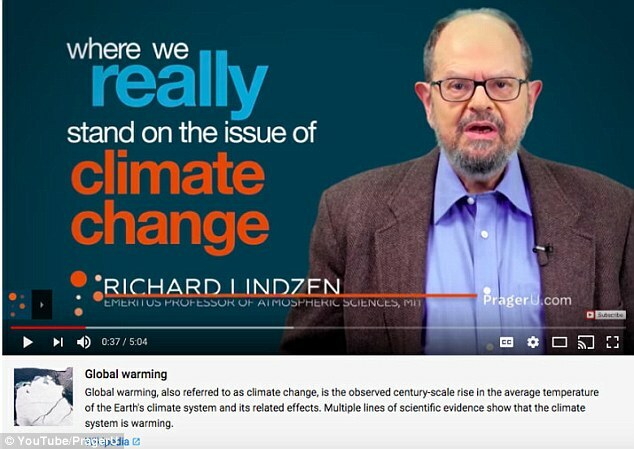 This week’s lead story features YouTube, which is fighting what it considers to be the misinformation on videos posted by global warming dissenters with fact-checking boxes (inset), with the data sourced from Wikipedia. We continue with Saudi Arabia’s oil production – is it up or down? ; the Saudi/Canada standoff; US LNG and Nord Stream 2; coal in Poland and China; nuclear in France and India; the Laos hydro dam collapse; Australia’s national energy guarantee; the hydrogen-to-ammonia “breakthrough”; renewables to power Blockchain; renewables and the UK capacity market; subsidies for UK SMRs; climate change to cause more windless periods and how to save the planet – give up meat. The system will surface information from Wikipedia or Britannica Encyclopedia to display factual information in bitesize chunks below videos on climate change. The feature is the latest step from the Google-owned video platform in its battle to reduce the spread of misinformation and conspiracy theories on the service. At the moment, the scientific fact-checking blurbs are only visible to US-based users, however, YouTube is slowly rolling-out the feature to viewers worldwide. YouTube says the policy is designed to give users easy access to external information to provide context and information on topics prone to misinformation. Last month, OPEC produced an average of 32.66 million bpd of crude oil, including production from its newest member the Republic of Congo. The biggest OPEC producer, Saudi Arabia, pumped 10.63 million bpd in July, up by 240,000 bpd from June and its highest level since its record of 10.66 million bpd from August 2016, according to Platts survey archives.